Christmas Inc. Home - Christmas Inc.
Say hello to a brighter Christmas. 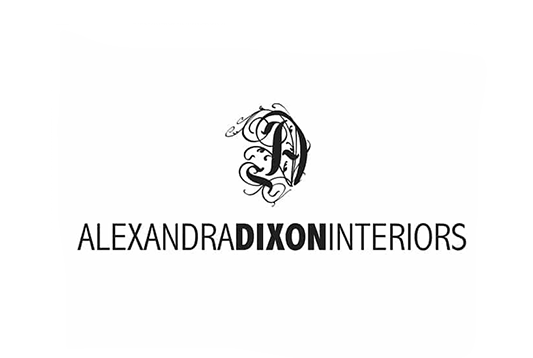 Based in the heart of the home counties, our dedicated team specialise in concept, design, and fabrication right through to installation, take down and storage. We’re not only passionate about Christmas, but also about great design and we’re on hand to help you every step of the way.  We’re committed to using the very finest quality products, which we source globally and regularly maintain.  We produce the majority of our bespoke items in-house, which allows us to deliver a luxurious service at an affordable price. We are the tree wrapping specialists! Our teams are some of the best in the country at what we do. Our client list and our catalogue of previous work is a testament to that. 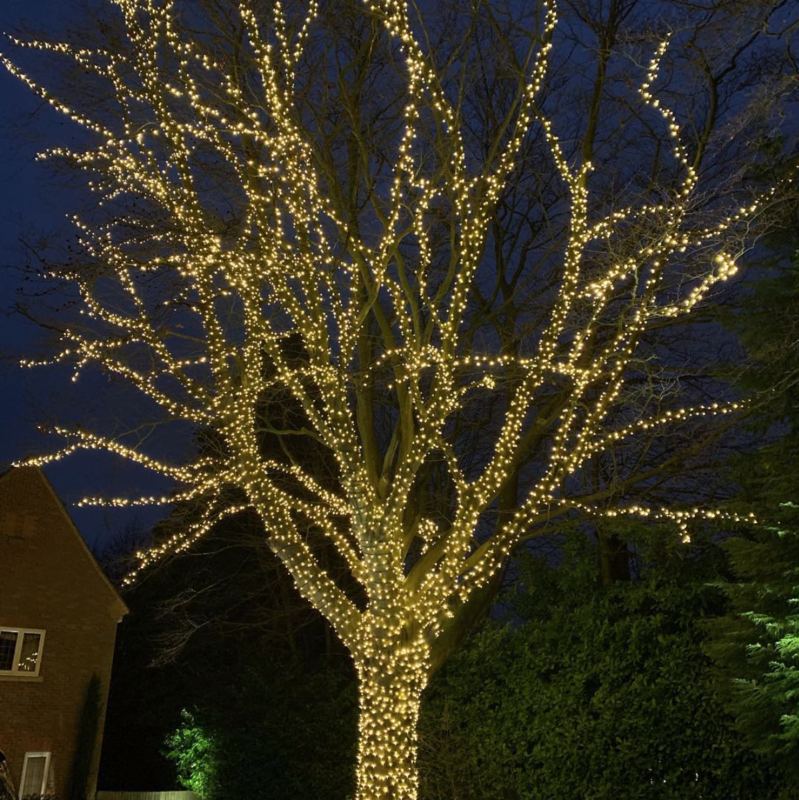 Here is a 70ft tall tree in Beaconsfield, Buckinghamshire lit in thousands of warm white LED lights. We leave these lights in for the clients to enjoy all year round. Here is a beautiful 7ft artificial tree dressed to a high standard in traditional colours. All of our trees are tailor-made for each client, we design them to compliment your home, your style, and your space. No two trees are alike – unless you want them that way of course! 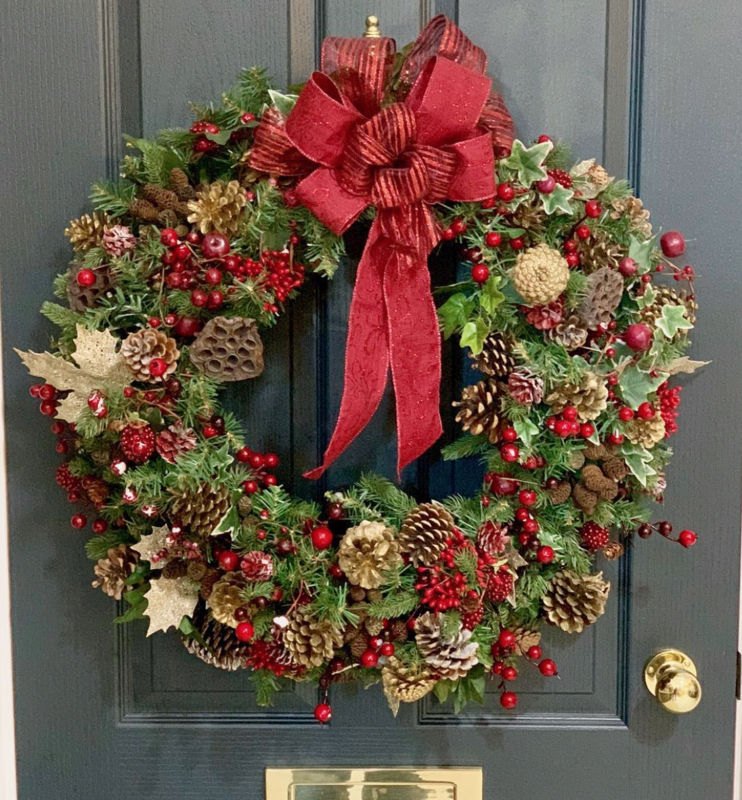 A beautiful, handmade festive door wreath. All of our wreaths are made to order, each one created to compliment your home, style, and requirements. 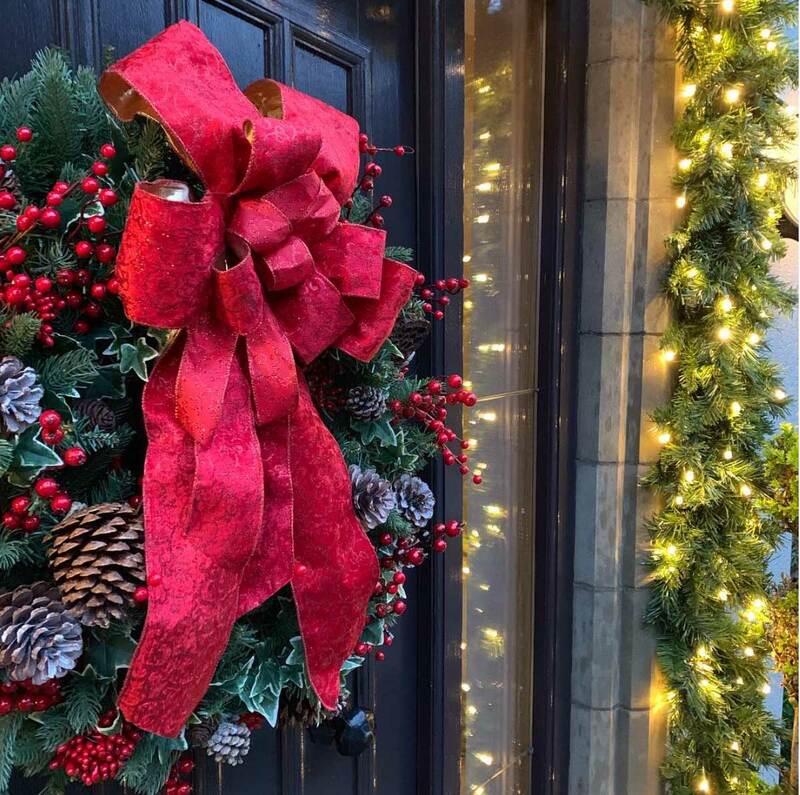 The majority of our wreaths are made from artificial materials meaning no matter the weather, your doorway will always look welcoming. 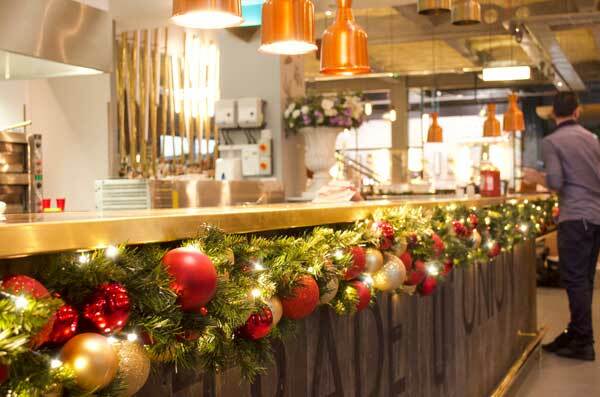 We decorate a vast amount of bars and restaurants across London and the country. Dirty Martini asked us to dress each and every one of their bars in their chosen theme. The decor ties in with the look and feel of each of their wonderful bars. With their current expansion and new bars opening every year in more and more locations, we’re constantly updating and adding to their collection of decorations ensuring that synergy carries through across the board. Is there a cosier picture than this? Don’t you just want to curl up and watch Christmas movies in front of the fire and the tree? This tree was dressed in our client’s specifications and colours. Dressed in lots of silver and pink, the tree compliments the client’s beautiful lounge perfectly. We dress this busy London bar in dozens of lengths of our luxury garland. Lit in warm white LED lights and decorated in tones that complement the surroundings. It’s important in busy bars to ensure the location of each piece is perfect. Not only will this ensure the decorations longevity but also maximise the impact with each item. Ensuring you get the ‘WOW’ factor throughout.  We pride ourselves on offering unparalleled service, from concept through to installation.  That’s why we get to dress some of the most impressive stores in the country for some of the biggest brands in the world. Christmas, Inc. has years of experience in bringing Christmas to retail. Whether you’re looking for an elegant lit exterior, window or a full in-store scheme.  We also work with some of the finest creative agencies in the country. We decorated this beautiful London office with luxury garlands, a beautiful tree in their reception and elegant external décor. We used colours to compliment the brand perfectly with lots of blues, gold, and silver. The grand central staircase has a real ‘wow’ factor as our luxury garland lines the banister, lit in warm white LEDs and smothered in beautiful glass baubles. 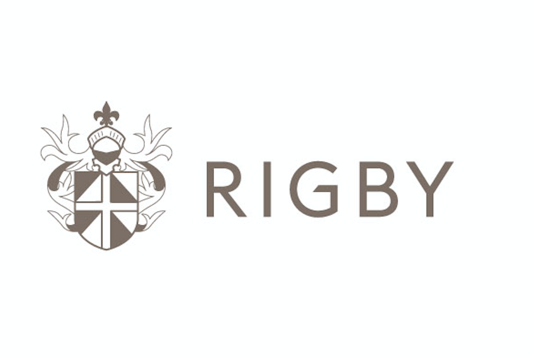 One of the world’s most famous diamond companies trusts us to decorate its flagship London store. 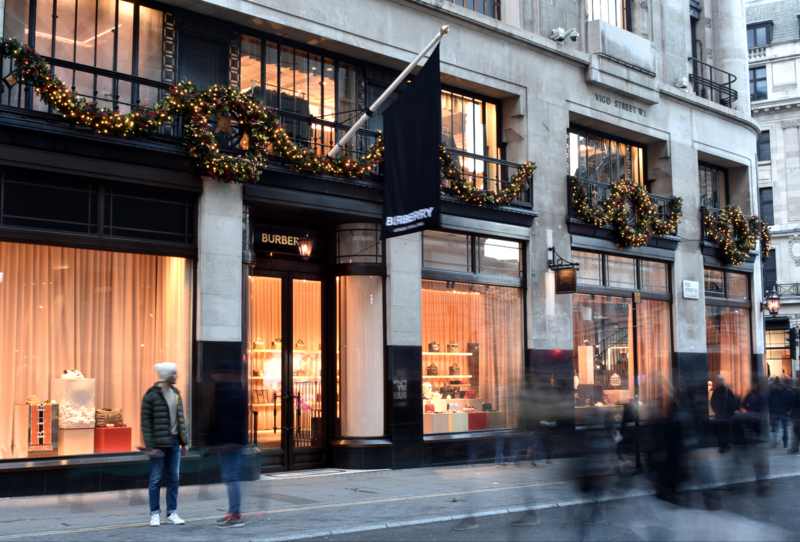 We decorate this famous Bond Street store in hundreds of feet of luxurious festive garland. Lit in thousands of warm white and blue LED lights. The garland is as striking as some of the diamonds within the store. 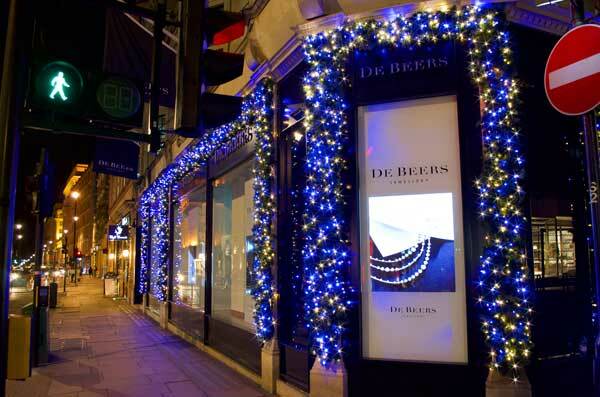 We also ship Christmas baubles to each and every DeBeers store worldwide. Industrial Chic eatery specialising in burgers and milkshakes. We dressed this chic eatery in simple/tasteful decorations that complimented the surroundings. Luscious oversize wreaths with giant bows and twinkling warm white lights filled the venue with a sense of Christmas. Concentrating on a few key pieces in key areas, we dressed each venue with a traditional look Christmas tree and festive garland. Lit in warm white LED lights and red and gold decorations. Thousands of baubles and hundreds of feet of garland were used in the dozen Draft House locations, ready for those to enjoy the yuletide festivities. 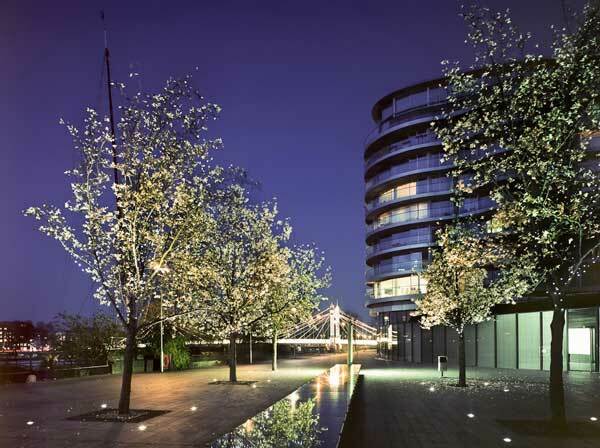 Our brief was to smother the trees onsite at this luxurious location in thousands of warm white LED lights, creating a striking visual impact from both the river below and the apartments above. The lights remain permanently on these trees so that they can be enjoyed all year round. The front of this family home is dressed in a luxurious festive garland, dressed in a natural look of pine cones, hessian ribbon, and lots of greenery. The garland and surrounding shrubs and plants are lit in warm white fairy lights. The interior is dressed in a classical theme to match the surroundings. Lots of greens and creams fill the stairs and mantle garland along with the Christmas tree in the family The lights used are traditional warm white LEDs which again keep with the look and feel of the property. We were asked by this family to dress both the internal and external of this beautiful property. 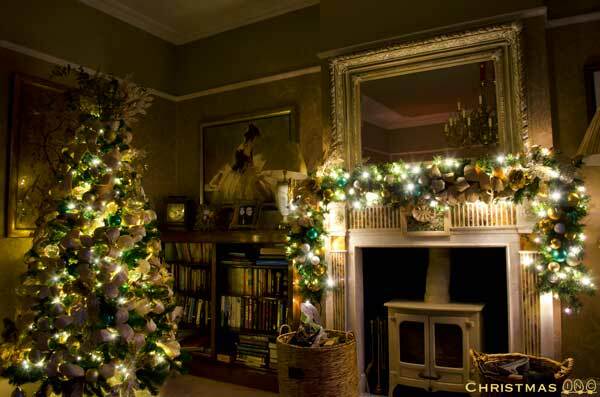 Dressing every room inside the home in traditional red and gold garland, lit in warm white lights. 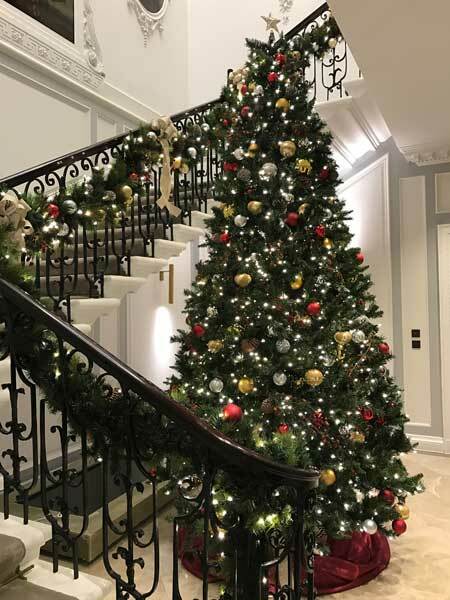 We dressed every fire mantel piece throughout the home, placed beautifully decorated trees in the prominent rooms and swaged luxurious garland up the entire banister. We also provided festive floral displays throughout the home, creating a real sense of Christmas wherever you were. We lit the front of this property in warm white festoon bulbs which the client keeps up all year. Following the contours of the roofline and garage, this creates a stunning effect once the sun goes down. We also placed a fresh 6ft Christmas tree on top of the porch smothered with warm white fairy lights. 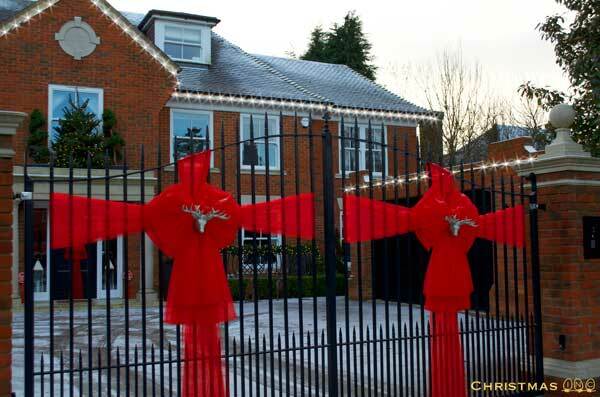 The gates are finished with giant red bows creating a wonderful welcome to those that enter. 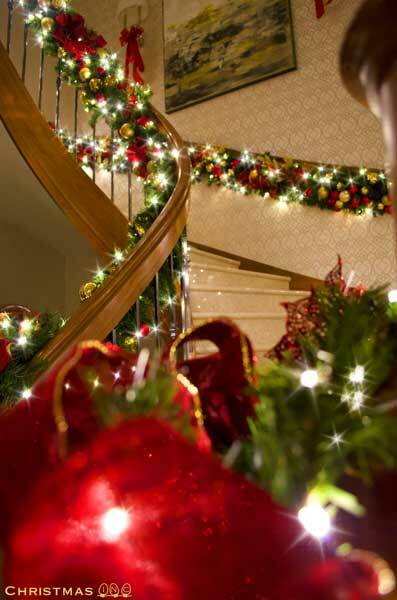 We were asked by this London based family to dress their entrance hall for the holidays. We went for an extremely traditional look and feel to complement their beautiful home. Filling the space with this huge12ft Artificial tree, dressed in beautiful red, gold and silver glass baubles and smothered with warm white lights. We also swaged luxury garland up the entire length of their banister finished with luxury bows to match.  Crowne Plaza is a stunning, newly refurbished, hotel, wedding and conference venue. 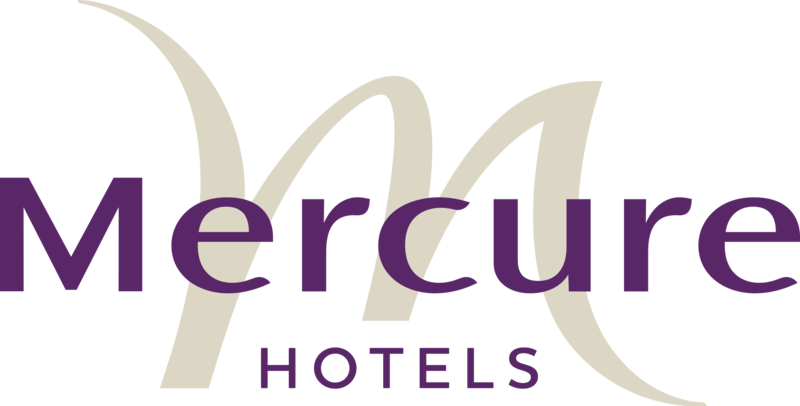 After their extensive refurbishment, we were asked to help create a real ‘wow’ factor for the hotels first new Christmas. 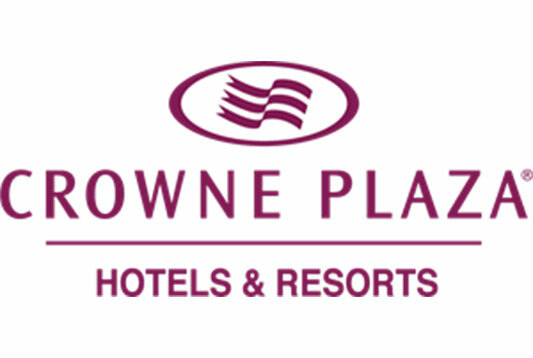 We fabricated a huge 4m tall cone tree which sits in the center of the hotels’ water fountain. Situated at the very front of the hotel entrance, the tree is visible from the road and all those passing and visiting. 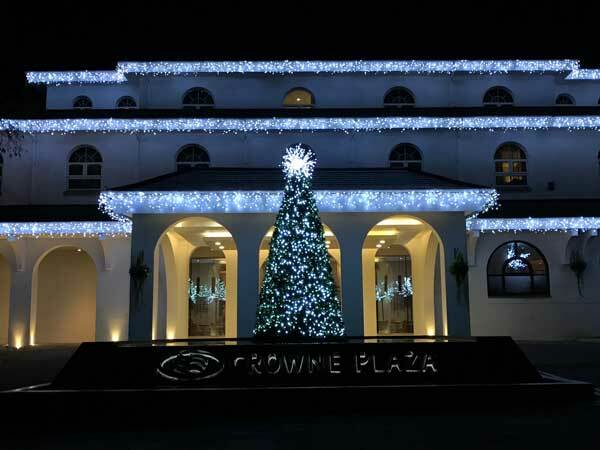 We then hung thousands of ice white icicle lights across all three levels of this grand home counties hotel, completing a modern contemporary look that is hard to miss. This large and unique residential property was lit in our warm white festoon lighting, following the contours of the roofline. This really is such a simple yet stunning way to light up a home at Christmas. We then added potted fresh trees to the porch roof and entrance doorway, again smothered in warm white fairy lights. Our fresh trees are hand-picked by us and cut the day of installation to ensure maximum freshness. A simple yet beautiful wreath adorns this doorway, welcoming all those that visit. We themed this wreath to match the tree within. Dressed to a high standard in a colour chosen by the client, which we feel compliments the house beautifully. Is there anything more festive than this image? ⁣We hung a beautiful hand-made wreath dressed in pinecones and berries, finished with a luxury oversized hand-tied bow. We then fixed our pre-lit festive garland around the door, perfectly framing the entrance to this beautiful family home. 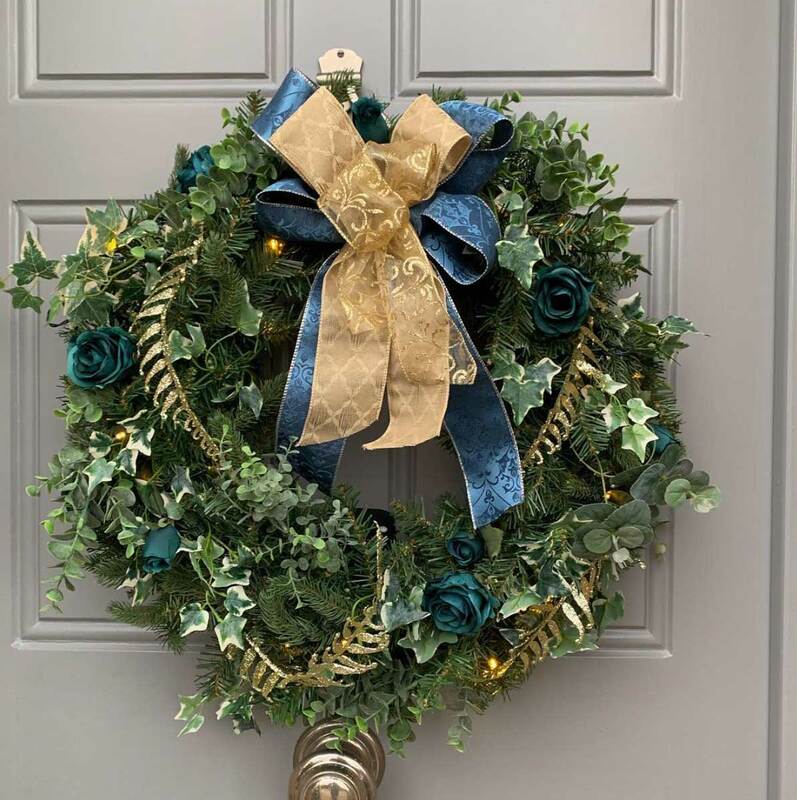 Creating a festive doorway is a really quick and simple way to dress your home at Christmas. This is a chic, scandi inspired tree installed in this modern office space. This 16ft artificial tree is dressed with simple white and silver decorations and smothered in warm white fairy lights. Here’s something a little bit fun. 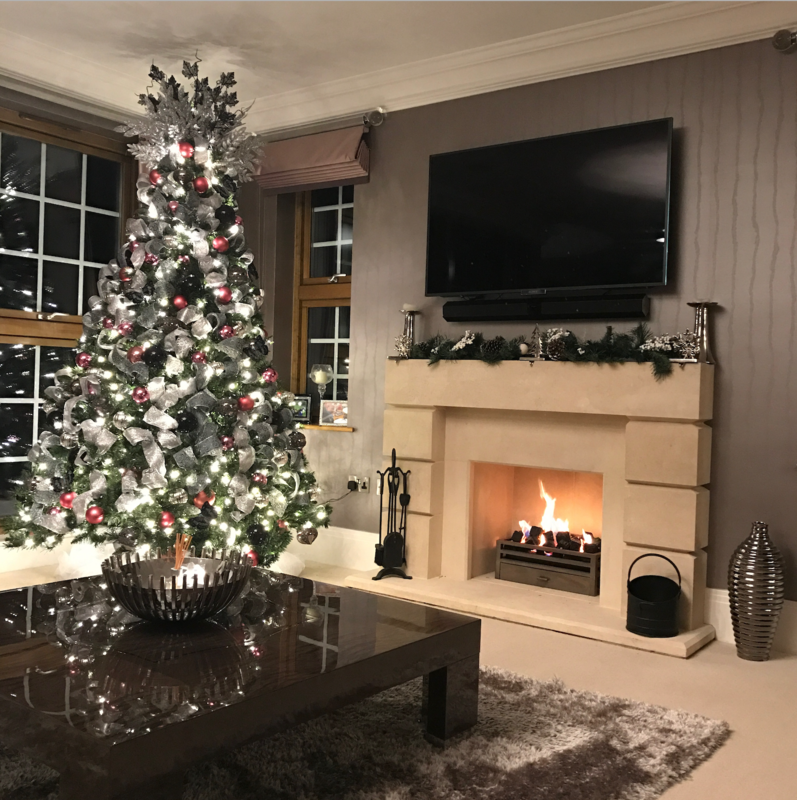 ⁣This is a 9ft artificial Christmas tree dressed in our ‘Winter Sparkle’ theme. 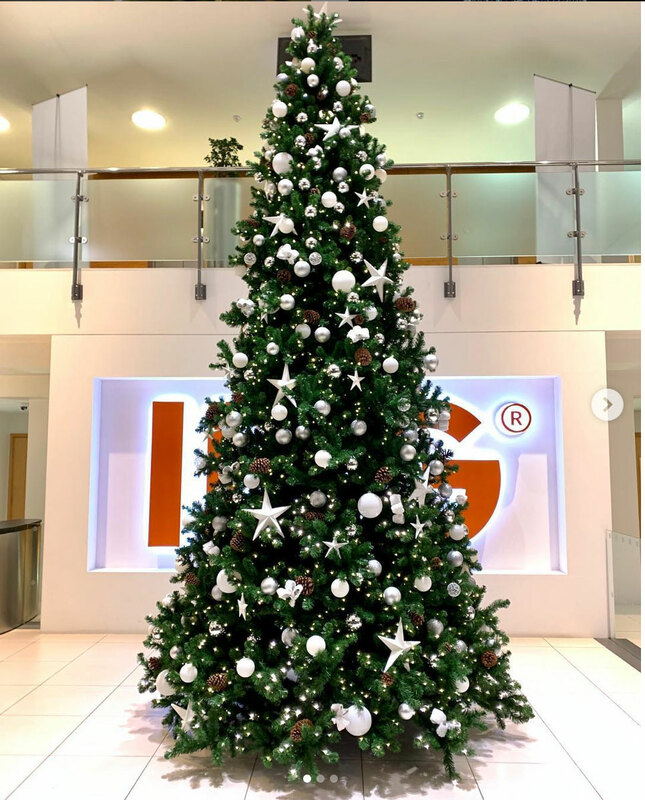 ⁣This was one of over fifty different trees we delivered to offices in the capital. Make an entrance this Christmas! 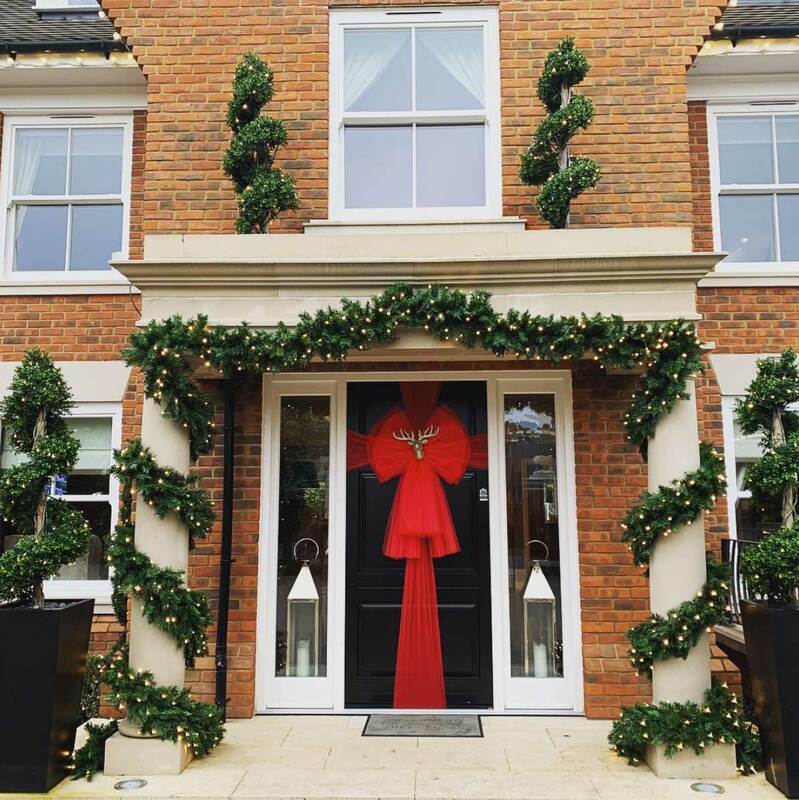 ⁣Our luxury festive garland looks wonderful swirled around pillars, lighting up this doorway. 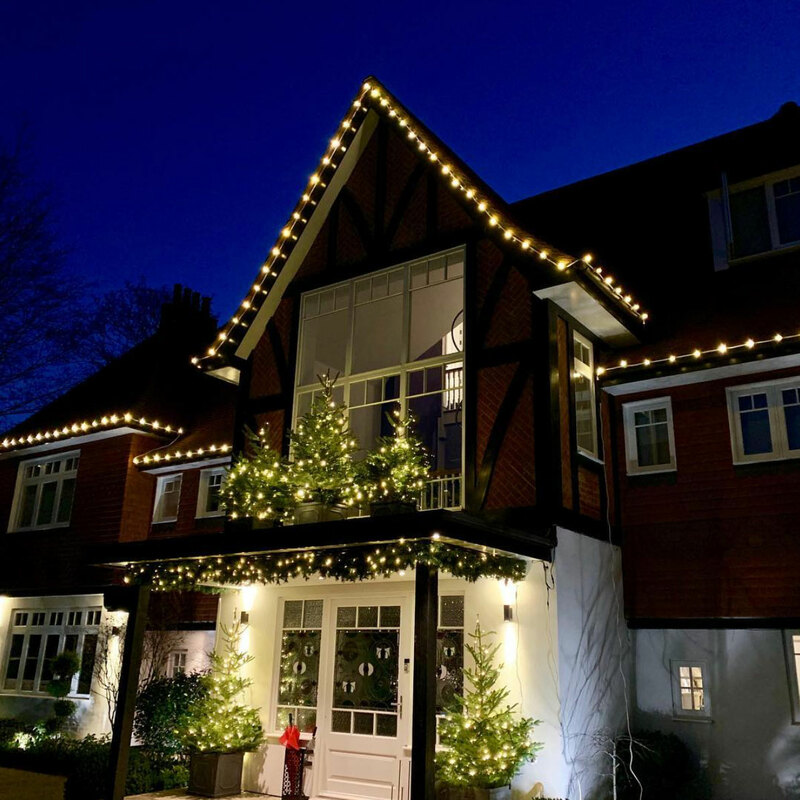 ⁣ With the addition of warm white lights smothered amongst the topiary, this family home won’t fail to make an impression to all that visit this Christmas. We love thinking outside the box and bringing ideas to life. We can create custom pieces for individuals or companies that will help promote your brand this Christmas. 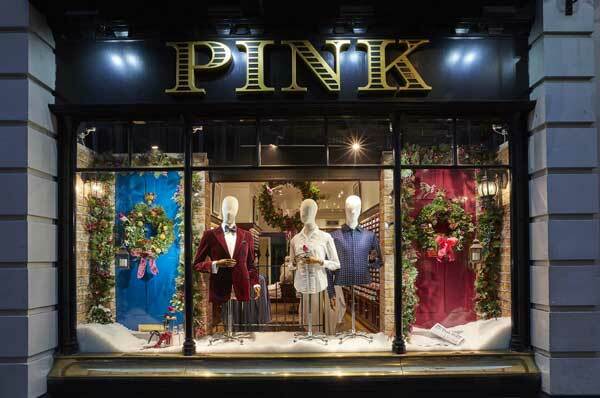 From shop windows to full external displays – we’ll have you covered this Christmas.  Everything that our in-house team creates is truly unique and we’ll be sure to help you stand out this coming year. With years of experience in bringing Christmas to retail, hotels, leisure and the corporate sectors, our in-house designers and fabricators can create a tailor-made solution to really make your store stand out this Christmas. We know that the most important thing is always family. Enjoy time with yours by letting us take the stress out of Christmas. Our designers have dressed some of the most beautiful houses in the country and work year-round keeping up with the latest trends, fashions, and themes. With endless options for both interior and exterior decorations, we’re sure to make any home sparkle this coming season. We believe that lighting is for more than just Christmas. Lift spirits and make warm memories during the cold days and nights. We provide a range of services to make your outdoor space come to life when the sun goes down. Whether it’s elaborate tree wrapping in thousands of lights, bushes and topiaries smothered in LEDs or a pergola and seating area lit in a soft warm white glow, we offer you suggestions on how to decorate a garden not just for Christmas. We can make sure you really get the most out of your outdoor space. If you have any questions or would like us to send you a brochure, please do not hesitate to get in touch.